Thursday, November 29th, Bradley Manning testified for the first time since his arrest two and a half years ago in Baghdad. Today also marks the two-year anniversary of the first front pages around the world from Cablegate, an archive of 251,287 U.S. State Department diplomatic cables -- messages sent between the State Department and its embassies, consulates and diplomatic missions around the world. In collaboration with a network of more than 100 press outlets we revealed the full spectrum of techniques used by the United States to exert itself around the world. The young intelligence analyst Bradley Manning was detained as an alleged source. WikiLeaks came under attack, with American politicians and right-wing pundits calling for all of us to be designated as terrorists, some even calling for my assassination and the kidnapping of our staff. Speaking on Meet The Press, Vice President Joe Biden referred to me as a "high-tech terrorist," while Senator Joe Lieberman demanded that we be prosecuted under the U.S. Espionage Act. The Department of Justice spokesperson Dean Boyd admitted as recently as July 2012 that the Department of Justice investigation into WikiLeaks is ongoing, and the Pentagon renewed its threats against us on September 28th, declaring our work an "ongoing crime." As a result, I have been granted political asylum and now live in the Ecuadorian embassy in London, surrounded by armed police while the FBI portion of the "whole of government" investigation against us, according to court testimony, had reached 42,135 pages as of December last year. Earlier this week, WikiLeaks released European Commission documents showing that Senator Lieberman and Congressman Peter T. King directly influenced decisions by PayPal, Visa and MasterCard to block donations to WikiLeaks, which has blocked 95 percent of our donors since December of 2010. 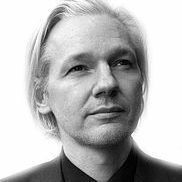 Last week the European Parliament expressed its will that the Commission should prevent the arbitrary blockade of WikiLeaks. Bradley Manning, who is alleged to be a source of the cables, started testifying on Thursday about his pre-trial treatment, which UN Special Rapporteur Juan Mendez said was "at a minimum cruel, inhuman and degrading treatment in violation of Article 16 of the Convention against Torture." Captain William Hoctor, the government psychiatrist with 24 years of experience who evaluated Manning at Quantico base in Virginia, testified that brig commanders had ignored his recommendations for Manning's detention, something he had not even experienced in his work at Guantánamo bay prison. Bradley Manning has been detained without trial for 921 days. This is the longest pre-trial detention of a U.S. military soldier since at least the Vietnam War. U.S. military law says the maximum is 120 days. The material that Bradley Manning is alleged to have leaked has highlighted astonishing examples of U.S. subversion of the democratic process around the world, systematic evasion of accountability for atrocities and killings, and many other abuses. Our archive of State Department cables have appeared in tens of thousands of articles, books and scholarly works, illustrating the nature of U.S. foreign policy and the instruments of U.S. national power. On the two-year anniversary of the start of Cablegate, I want to highlight some of the stories that have emerged. The United States' War on Terror has claimed hundreds of thousands of lives, inflamed sectarian violence, and made a mockery of international law. Victims and their families struggle to have their stories acknowledged, and the U.S.' systematic avoidance of accountability for war crimes implicitly denies their right to be considered human beings. Moreover, as the U.S. increasingly relies on clandestine military operations conducted outside the scrutiny of government oversight, the execution of this expanding War on Terror becomes increasingly uncoupled from the democratic process. While President Obama had promised the American people in 2008 that he would end the Iraq War, U.S. troops were only withdrawn when information from a cable revived international scrutiny of abuse occurring in Iraq, resulting in a refusal to grant continued immunity to U.S. troops in 2012 or beyond. In 2007 the U.S. embassy in Baghdad obtained a copy of the Iraqi government's final investigation report on the massacre of 17 civilians on September 16th, 2007 in Nisour Square. The report concluded that the incident was an unprovoked attack on unarmed civilians, asked for $8 million in compensation for each death and $4 million for each injury, and demanded that the private security firm Blackwater be replaced within six months. Blackwater continued to operate in Iraq for two years afterwards, and the U.S. Embassy compensated victims with $10,000 for each death and $5,000 for each injury. Five years later, the offending Blackwater mercenaries have escaped from accountability to Iraq, and attempts to bring them to justice in the U.S. have resulted in a long chain of dismissed cases and one undisclosed settlement. WikiLeaks' Iraq War Logs release of 391,832 U.S. Army field reports uncovered 14 additional cases where Blackwater opened fire on civilians, along with numerous other incidents of abuse. The Iraq War Logs also showed how the United States handed over prisoners to be tortured in gruesome detail -- stories of electrocution, mutilation and of victims being attacked with drills. The fact that, five years on, the victims of the Nisour Square Massacre have seen no meaningful accountability is an atrocity. But it is unfortunately no surprise that the U.S. claims immunity for its forces in other countries, then fails to administer justice at home. These events -- and in particular one cable detailing the summary execution of 10 Iraqi civilians, including four women and five children -- by U.S. soldiers and a subsequent airstrike to cover up the evidence, forced the U.S. withdrawal from Iraq in 2011. The story of handcuffed execution and cover-up sparked outrage around the world in the midst of negotiations to extend U.S. troop presence into 2012 and, in response to international coverage, Iraq revived its investigation into the incident. Iraq ultimately refused to grant immunity to U.S. troops in 2012, forcing the U.S. to withdraw in December 2011. This systemic violence and cover-up extends to the war in Afghanistan. When news emerged that a midnight bombing campaign on the Afghan village of Granai in 2009 had possibly resulted in the death of up to 100 civilians, U.S. officials publicly asserted that most of the dead had been Taliban fighters. A State Department cable written shortly after the event summarizes a meeting between the Red Cross' Afghanistan chief Reto Stocker and U.S. Ambassador Carl Eikenberry in which they discussed findings from an investigation of the event. In the cable, Stocker is referred to as "one of the most credible sources for unbiased and objective information in Afghanistan." The Red Cross report estimated that 89 of the dead and 13 injured were in fact civilians. Neither the U.S. government nor the Red Cross publicly revealed these figures. The Tunisian cables describe the extreme corruption and lack of transparency of the Ben Ali regime. The Ben Ali extended family are described as the worst offenders, their lavish life accompanied by "a wide-range of corrupt schemes," including "property expropriation and extortion of bribes." We also learned that Ben Ali family assets included an airline, several hotels and a radio station. One cable describes state censorship of Tunisia's only private broadcast satellite TV station, and a surprise tax judgment against the station of almost $1.5 million. "While the 'Jasmine Revolution' in Tunisia would not have happened without the long struggle of brave human rights defenders over the last two decades, support for activists from outside the country may have been strengthened as people scrutinized the WikiLeaks documents on Tunisia and understood the roots of the anger. In particular, some of the documents made clear that countries around the world were aware of both the political repression and the lack of economic opportunity, but for the most part were not taking action to urge change." When Tunisia's president Moncef Marzouki spoke with me on The World Tomorrow, he thanked WikiLeaks for its work, saying, "I am very grateful for all that you have done for promoting human rights, truth, and I admire and support your efforts." Shortly following Tunisia's revolution, protests erupted in Libya, and a new batch of cables revealed the strategic calculations behind U.S. support of the Gaddafi regime. In Egypt, cables revealed that Mubarak would rather die in office than step down and that his son would likely succeed him. Then, just as evidence emerged that Vice President Suleiman was tipped to replace Mubarak, cables were released detailing his former role as intelligence chief, as well as his close ties to Israel. Such elements became a crucial part of the ongoing Egyptian uprising. A Global Death Squad Consulting Firm? For years, WikiLeaks faced a chorus of accusations by U.S. officials and right-wing pundits of making the world a less-safe place, and of having potentially caused harm through publication of embarrassing secrets. In reality, the cables show that torture and killing are not isolated events, but the violent manifestations of an aggressive policy of coercion used by the United States in the pursuit of its strategic commercial and political goals around the world. While U.S. law bans the training of military units with a history of human rights violations, in practice the law is easily and often circumvented. The Indonesian army's elite special forces unit KOPASSUS has brutally repressed the West Papuans' freedom movement (West Papua has been occupied by Indonesia since 1963), as has been extensively documented by Human Rights Watch. Despite this, U.S. diplomats in Jakarta judged in 2007 that the time had come to resume collaboration with KOPASSUS, for the sake of "commercial interest" and "the protection of U.S. officials." A diplomatic cable from November 2009 mentions as a side note that right-wing paramilitaries in Colombia were responsible for the death of 257,089 victims, a figure well above the estimations of local human rights activists. The U.S. has nonetheless offered generous support to the Colombian military; Amnesty International, which has called for a complete cut-off of U.S. military aid to Colombia, has estimated that total U.S. aid in 2006 amounted to $728 million, of which 80 percent was given to military and police assistance. As of 2012, U.S. military support to Colombia is ongoing. Such examples illustrate the United States' liberal interpretation of the laws banning the training of military units with a history of human rights violations. In another cable from August 2008, U.S. officials acknowledge that the Bangladeshi death squad, the Rapid Action Battalion (RAB), has been involved in obvious human rights violations, making support for the RAB difficult -- U.S. officials hoped, however, to improve the RAB's record and polish its public image. U.S. officials praised the RAB for having "succeeded in reducing crime and fighting terrorism, making it in many ways Bangladesh's most respected police unit." In a diplomatic cable from 2009, it was also revealed that the UK had been training the RAB for the previous 18 months "in areas such as investigative interviewing techniques and rules of engagement." In 2009, Hillary Clinton sent an intelligence gathering directive to 33 embassies and consulates around the world. The directive asked diplomats to gather intelligence on UN officials, including credit card numbers and online handles. A similar cable requested intelligence on officials from the Democratic Republic of Congo, Burundy, Rwanda and Uganda, and specifically mentioned the collection of DNA samples, iris scans and computer passwords. Another state department cable revealed that a mole within the German government was spying for the U.S. Embassy in Berlin, frequently updating U.S. officials on negotiations between Merkel's conservative Christian Democrats and Westerwelle's FDP on the formation of a new coalition government in 2009. Helmut Metzner, formerly chief of staff to Germany's foreign minister, admitted to being the mole mentioned in these cables when this story broke in the press, and was subsequently fired. Abuse that occurs in war, as it did in Iraq, is often dismissed by its perpetrators as exceptional, and we are often assured that when abuse has occurred, the accountability mechanisms in place will bring justice. The diplomatic cables have given us numerous concrete examples of the coercion used by the U.S. to manipulate and undermine judicial processes in other countries, and they establish a clear policy for the evasion of accountability in any form. During the 2003 U.S. invasion of Iraq, two journalists -- including the Spanish journalist José Couso -- were killed and three others were wounded when a U.S. tank fired on the Palestine Hotel in Baghdad. An investigation into the event was subsequently launched in Spain, and an international arrest warrant was issued for three U.S. soldiers involved. Cables showed that the U.S. aggressively fought to have Spanish officials drop the case. Writing about the case in one cable, U.S. Ambassador Eduardo Aguirre emphasizes: "While we are careful to show our respect for the tragic death of Couso and for the independence of the Spanish judicial system, behind the scenes we have fought tooth and nail to make the charges disappear." Shamefully, this quote was redacted in the original reporting on the subject from El Pais and Le Monde. In another example from 2003, a German citizen of Lebanese origins, Kalid el-Masri, was kidnapped while on vacation in Macedonia, renditioned to Afghanistan by the CIA, and tortured for four months. When his captors finally decided he was innocent, he was flown to Albania and dumped on a country road without so much as an apology. In a cable from 2007, we learn that when a German prosecutor issued arrest warrants for agents involved in el-Masri's kidnapping, the U.S. ambassador in Berlin warned German officials that there would be repercussions. No arrests have yet been made and el-Masri is still seeking justice. The U.S.' manipulation extended to the UK, where a cable shows that during a British public inquiry led by Sir John Chilcot into the UK role in the Iraq War, the Ministry of Defence had "put measures in place" to protect U.S. interests. On environmental issues, cables show that the U.S. routinely makes symbolic gestures rather than initiating substantial practices to combat climate change, and works aggressively to tailor international agreements to its own commercial interests. Secretary of State Hillary Clinton asked embassies to gather intelligence on the preparations for the Copenhagen UN Convention on Climate Change Meeting in December 2009, asking for biographical details of representatives from China, France, Japan, Mexico, Russia and the European Union. Cables show that in Copenhagen the U.S. manipulated the accord talks by offering "gifts" to poorer countries to derail opposition to the accord proposed by first world powers. Another cable from the Secretary of State revealed that in 2010, a Maldives ambassador designate had stressed the importance of "tangible assistance" from larger economies to smaller ones. As a consequence of this meeting, the accord offered financial compensation to poor countries suffering from the effects of global warming. In a visit to Canada in 2009 David Goldwyn, the State Department's Coordinator for International Energy Affairs discussed public relations assistance to be offered to the oil sands industry. Goldwyn proposed consulting experts, scholars and think tanks to "increase visibility and accessibility of more positive news stories." The cable was later used by environmentalists in their battle against the Keystone XL pipeline, which ships crude oil across the U.S.-Canada border. In early 2012, President Obama rejected the Keystone XL pipeline proposal, but recently publicly announced support for another proposal. It also turns out that Goldwyn eventually went on to work for Sutherland, a lobbying group in favor of Keystone XL. The cables also reveal that the U.S. is carefully positioning itself to take advantage of new opportunities for harvesting hydrocarbons and minerals from the Arctic as climate change melts polar ice. U.S. diplomats were hoping to offer Greenland support for its independence from Denmark in exchange for access by American gas and oil companies to exploit the country's resources. The U.S. has been closely watching Russia, America's main competitor for Arctic resources, but American officials also showed concern over Canada's potential territorial claim to the Arctic's Northwest passage. The State Department cables revealed that the United States and its allies systematically make secret arrangements with various governments, hiding details not only from the country's public, but sometimes even from the country's representatives, ministers and oversight bodies. In 2009, Jeremy Scahill and Seymour Hersh broke a story in The Nation on secret U.S. special operations forces combat missions and drone strikes in Pakistan. When questioned about the story, Department of Defense spokesperson Geoff Morrell dismissed the claims as "conspiratorial theories." Only one year later, cables released by WikiLeaks confirmed their story. In addition, cables quoted Pakistan's Prime Minister Yousuf Raza Gilani telling U.S. officials: "I don't care if they do it as long as they get the right people -- we'll protest about it in the National Assembly and then ignore it." Stories based on State Department cables also revealed agreements between the U.S. and Yemen in which the Yemeni government would claim responsibility for attacks launched by the U.S. on local militia groups. The release of State Department cables resulted in total transparency with respect to certain aspects of the War on Terror. State Department cables also revealed that the U.S. worked with Australia to weaken the text of an international agreement banning the use of cluster munitions -- bombs which spray thousands of smaller bomblets over a large area. Out of more than 13,000 casualties of cluster munitions registered by Handicap International, over 98 percent are civilian and one-third of those are children. Despite this, cables also revealed that the UK's then-Foreign Minister David Miliband secretly approved the use of a legal loophole to allow the United States to store cluster munitions on UK territory, despite the fact that the UK is a signatory to a convention banning them. The United States is not a signatory to the Convention on Cluster Munitions, and even attempted in 2011 to have the ban lifted by the UN. In 2007, former Canadian Deputy Prime Minister John Manley asked U.S. officials for predator drones to help shore up liberal support for a sustained Canadian presence in the war in Afghanistan. At the time, Manley was leading a government-appointed panel charged with investigating Canada's interests in a future role in Afghanistan. In August 2012, the Ottawa Citizen reported that the Canadian government is seeking to spend up to $1 billion on a state-of-the-art armed drone fleet. The cables also revealed that Canada's conservative Prime Minister Stephen Harper secretly promised NATO in January 2010 that Canada would remain in Afghanistan to conduct army training even after the end of its mission in 2011. The Canadian public was shocked when the government announced that it would be extending its mission in November of that year. Harper expressed concern to U.S. diplomats that an early departure of Canadian troops from Aghanistan would seem like a "withdrawal," reflecting the low public support for Canada's mission in Afghanistan. In 2008, the U.S. proposed an "informal agreement" to Swedish government officials for the exchange of information on terrorism watch-lists. U.S. officials explained that they feared scrutiny by the Swedish parliament would jeopardize "law enforcement and anti-terrorism cooperation." Cables also revealed that in 2009, the U.S. resumed full intelligence-sharing with New Zealand after it had been restricted in retaliation for the country's ban against nuclear-powered or armed vessels in its ports. Both governments agreed that the newly resumed cooperation should be kept hidden from the public. State Department cables illustrate that U.S. officials and their commercial partners take a default position of having an intrinsic right to resources and market dominance around the world. "Country team Paris recommends that we calibrate a target retaliation list that causes some pain across the EU since this is a collective responsibility, but that also focuses in part on the worst culprits. The list should be measured rather than vicious and must be sustainable over the long term, since we should not expect an early victory." The cables also showed that the U.S. revoked visas of then-Ecuadoran presidential candidate Xavier Neira and seven others due to their involvement in a legal case against the American pharmaceutical company Pfizer for unfair competition. The timing of the decision to revoke their visas coincided with the upcoming presidential elections and an impending court decision on the case. In its explanation of the revocation, officials cite "corruption" and the case against Pfizer. The U.S.-based Shell Oil company has a long and sordid history in Nigeria, and its representatives spoke openly about activities in the country. In a 2009 meeting, Shell representatives told U.S. officials that they would be able to influence the Nigerian government's 2009 Petroleum Industry Bill to suit their interests. Cables from 2005 highlight U.S. determination to "improve the investment climate" for mining companies in Peru. Representatives from Canada, UK, Australia, Switzerland and South Africa met to strategize ways of circumventing anti-mining protests coming from a diverse group of NGOs, the Catholic Church and indigenous Peruvians. Once protests had turned violent, the U.S. used this as an excuse for monitoring NGO groups such as Oxfam and Friends of the Earth, and asked the Peruvian government to enhance security by taking control of roadways and transit areas. In other cases, officials in the U.S. Embassy assisted in lobbying for or against particular pieces of legislation according to U.S. commercial interests. U.S. officials lobbied on behalf of Visa and MasterCard against a bill in Russia which would have created a national card payment system, taking away Visa and MasterCard's market share. A cable summarizing a meeting with a director of Al Jazeera shows that U.S. officials expected a special report with graphic images of injured Iraqis to be changed and its images removed. In another cable, the director is asked to explain Al Jazeera's lack of coverage of the Iran elections and protests as opposed to their "heavy" coverage of Gaza. The U.S. Navy's Fifth Fleet is based in the kingdom of Bahrain, and the U.S. has maintained a mutually beneficial relationship with the country's leaders over the past years. In one cable, the U.S. ambassador to Bahrain praised the country and its king, pointing out that U.S. companies had won major contracts there. This same regime brutally cracked down on protesters during the Arab Spring, and Bahraini authorities shut down dissident websites and publications. While the U.S. State Department harshly condemned the crackdown on protests after Iran's 2009 elections, it remained silent on the killings in Bahrain. Thailand's lèse majesté law prevents anyone in the country from speaking openly about the monarchy without risk of severe punishment. As such, any reports about political developments in the country are censored, and there is a huge gap in public knowledge about the country's political environment. WikiLeaks' release of State Department cables gives an unprecedented view of not only the monarchy's deep impact on the politics of the country, but also the close relationship that Thailand had with the U.S. Journalist Andrew MacGregor Marshall quit his job at Reuters to write his book Thailand's Moment of Truth, using the Thai cables exposing obscured and taboo aspects of Thailand's politics, history and international relations for the first time. U.S.-based lobbying groups work hand in hand with U.S. State Department officials around the world to aggressively lobby for legislation and trade agreements that favor American companies such as Google, Facebook, Apple and Microsoft, or large film studios such as Disney, Paramount, Sony and Warner. A 2006 cable from Japan describes the first draft proposals for a "gold standard" in intellectual property rights enforcement, called ACTA. This standard was meant to give intellectual property owners much stronger powers, even at the expense of citizen privacy and due process. ACTA was subsequently negotiated in secret, unknown to the general public, until WikiLeaks leaked the first draft in 2008. In the film industry, the lobbyist group for motion picture studios conspired with their Australian counterpart to establish a legal precedent for holding an Internet service provider accountable for copyright infringement in Australia. What is the effect of this push and pull? It is a global environment where legislation and legal precedents are set to benefit intellectual property owners who are rich, powerful and influential -- even at the expense of public good. The examples I present above represent only a small fraction of what has been revealed by WikiLeaks material. Since 2010, Western governments have tried to portray WikiLeaks as a terrorist organization, enabling a disproportionate response from both political figures and private institutions. It is the case that WikiLeaks' publications can and have changed the world, but that change has clearly been for the better. Two years on, no claim of individual harm has been presented, and the examples above clearly show precisely who has blood on their hands. In large Western democracies, the political discourse has been so highly controlled for so long, that it is no longer shocking when Western experts fill in to speak for third world victims, or when an American president stands up at a podium to accept his Nobel Peace Prize, and makes the case for war. It is, in fact, no longer safe to presume that a media outlet such as The New York Times would perform the same act today as they did in 1971 when Daniel Ellsberg leaked the Pentagon Papers. "The thing is when the government says -- you know -- by publishing a story you're harming the national security, you're helping the terrorists. I mean, there are still people today who argue that the NSA program was the crown jewel, the most valuable anti-terrorism program that the Bush administration had going, and that it was terribly wrong of the Times to publish." "The secrecy of these documents has so far condemned over 30,000 Americans to death and several million Vietnamese. And the continued secrecy of them will undoubtedly contribute to the death of tens of thousands more Americans, and so forth. I think that's true. But that comes up in the WikiLeaks case, right now." Since the release of the diplomatic cables, WikiLeaks has continued its operations despite the financial blockade, publishing leaked documents from companies selling mass interception units to state spy agencies around the world; detainee profiles for almost all of the people detained at Guantánamo Bay prison; U.S. policy manuals for detention of military prisoners in the War on Terror; intelligence databases from the private intelligence firm Stratfor; and millions of documents from inside the Syrian government. The information we've disclosed frustrates the controlled political discourse that is trumpeted by establishment media and Western governments to shape public perception. We will continue our fight against the financial blockade, and we will continue to publish. The Pentagon's threats against us do the United States a disservice and will not be heeded. With thanks to WikiLeaks Press for research.